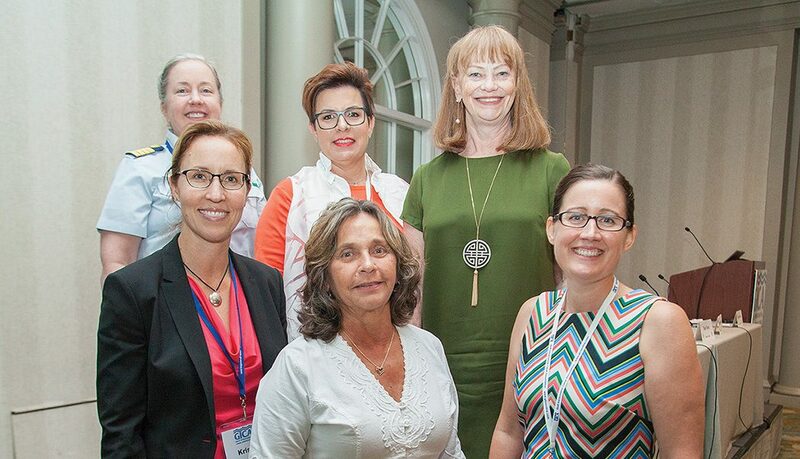 A new and timely addition to the agenda at the Gulf Intracoastal Canal Association’s annual seminar August 1–3 was a panel titled “Brownwater Women,” which featured six women in conversation about their experiences in the maritime industry. Panelists included Cherrie Felder, vice president of Channel Shipyard Companies; Cathy Shantz Hammond, CEO of Inland Marine Service; Tava Foret, executive vice president of operations for the Towing Vessel Inspection Bureau; Mary McCarthy, quality systems manager for Canal Barge Company Inc.; Capt. Jackie Twomey, commander of Marine Safety Unit Port Arthur, Texas; and Capt. Kristi Taylor, a Houston Pilot. One by one, each panelist shared how she was introduced to the maritime industry, reflected on early experiences, and discussed how the industry has changed over the years, especially regarding the role women play in it. Felder, who started out in the maritime industry 40 years ago, led off, emphasizing how rich and rewarding her career has been. “It’s been an amazing career, and I’ve loved every single minute of it,” Felder said. Felder said, in some ways, she doesn’t feel as if the role of women in the maritime industry is anything new. Still, when she was asked to be a panelist discussing “brownwater women,” it made her stop and reflect on what has changed over the years. Even so, Felder said she never questioned her role or that she belonged. Hammond said her entry into the maritime industry was by marriage initially. Early on, her husband worked in the maritime industry, and she was a teacher. Then in the late 1980s, she went to work for Inland Marine. The first thing she did was to truly “learn the river,” Hammond said, by seeing the river from onboard a towboat. Throughout her time on towboats, Hammond said she had a wide range of roles, from decking and cooking to keeping watch and assisting the engineer on board. “I’ve asked every dumb question known to mankind, I’ve been made fun of, I’ve been criticized, I’ve been reprimanded and I’ve served as a member of the crew,” Hammond said. “So everything I know, I learned from the mariners out on the boats. Shoreside, though, Hammond said it was tough early on with so few women in the industry who were peers and colleagues. She recalled the first time she attended the Greater New Orleans Barge Fleeting Association’s conference. Hammond said she recalls being so intimidated that she didn’t attend the opening cocktail reception. But it didn’t stay that way, she said. In 1994, Inland Marine joined The American Waterways Operators (AWO). Hammond became a voice for smaller companies, she said. Hammond got involved with AWO’s program for small businesses, taking along Inland Marine’s operations manual. Hammond said her view is that sometimes women have to prove they know something, whereas it’s assumed that men do. Foret, who has 25 years in the industry, started out in 1993 with Hollywood Marine. She, like Hammond, said she learned the industry by interacting with mariners, particularly in a training environment. She spent six years at Hollywood, through the company’s merger with Kirby Inland Marine, then spent about a year away from the maritime industry. “I realized just how much I missed operations and working with the people to develop training,” she said. She got back into the industry and eventually began doing vessel audits. Foret recalled her first industry meeting, which like Hammond’s was in New Orleans. Foret described Felder and Hammond as trailblazers for women in the maritime industry. Looking at their example, Foret offered a poignant takeaway for the GICA audience. “I would say don’t make excuses—make a way,” she said. McCarthy, the youngest member of the panel, got her start in 2006 at AWO. Four years later, she began in operations at Canal Barge in New Orleans. McCarthy was fast to point out that the maritime industry as she’s experienced it is a lot more open to women than in decades past. “I owe a great debt to everyone who came before,” she said. McCarthy said she feels that the industry is very merit-based and passion-based, which opens opportunities for women and men alike. McCarthy said she’s never felt limited in her role, but she has had to navigate clashes between traditional and contemporary points of view. McCarthy attributed the growth of women in the industry to three main causes: changing attitudes toward women in the workplace in general; technology, which allows work access remotely during maternity leave, for example; and industry groups for women. McCarthy mentioned three associations in particular: WISTA (Women’s International Shipping & Trading Association), WIMOs (Women in Maritime Operations) and ADMIRALTY, a networking group for young adults in the industry. “We’re able to make connections really fast,” she said, adding that those connections help retain women in the maritime industry for the long term. Twomey then described how she has experience both in the merchant mariner world and in the Coast Guard. She attended the United States Merchant Marine Academy in Kings Point, N.Y., where during her last three years she was the only woman in her class. She in particular had a message for younger people entering the industry and for those without a legacy connection to the waterways. Taylor, like Twomey, grew up far away from the sea or major waterway, yet found her way to the Merchant Marine Academy. After she finished, she started out as a deckhand, working 15 years on workboats. Then in 2011, she got into the Houston Pilots’ training program. Taylor went on to recount several instances from the Houston Ship Channel that highlighted the high level of professionalism in both brownwater and bluewater operations. Felder, then, closed the panel’s discussion with a word of exhortation, encouraging women and men alike in the maritime industry to seek out mentors and serve as mentors to others. In so doing, they learn from others and help share years of experience with newcomers.